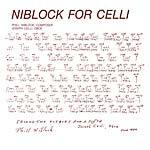 Phill Niblock's Music For Cello collects three pieces from the '70s and early '80s, performed by cellist David Gibson. This CD includes a 16-page unpublished interview with Niblock. Since the late sixties Phill Niblock has been composing long-form acoustic drones with a focus on the rhythms and overtones that rise from closely tuned instruments. His highly original and influential music is an exploration of timbre, microtonality, stability, duration and psychoacoustic phenomenon. "3 To 7 - 196' is very direct, aggressive, and gritty. The overtone patterns that are produced by the proximal pitches become more prominent with louder volume. So please, play this piece very loud. This was the first piece of mine in which the musician was precisely tuned, in which I chose exact pitches in hertz. We used a sine wave oscillator and frequency counter for the tuning. 'Descent Plus' has four cello tones descending one octave over twenty-two minutes, from 300 hertz to 150 hertz. David Gibson played these tones without lifting his bow from the strings, constantly retuning. I made four different scores, manually changing an oscillator to which he was tuning, for each track's recording. For the revision, we added six more tracks, with David playing long tones which were not descending. The second part of the recording was made nearly twenty years later. 'Summing II' (one of four parts) is mellow and sonorous. David plays two strings simultaneously, one of which is retuned for each successive recording of that pair of tones. This is a mix of an eight-track tape. It's better played loud also." --Phill Niblock, from the liner notes. 1993 release. Music by Phill Niblock features The Soldier String Quartet performing in Five More String Quartets, a piece for five multi-tracked string quartets and in Early Winter for flute, bass flute, string quartet, and synthesizer, also featuring Susan Stenger (flute) and Eberhard Blum (bass flute). In Five More String Quartets the musicians are tuned to specific pitches by calibrated sine tones as they play and the sound they produce is recorded, unprocessed, to multitrack tape. The piece is built up by means of multitrack recording. Early Winter has a different structure: a mixing of recorded instruments, computer controlled electronic instruments, and live instruments in the studio. 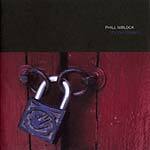 "An overview of Phill Niblock's work since the '60s, through about twenty essays and interviews by musicologists, art critics and historians, various documents, scores, and more than eight hours of videos on two double layer DVDs. With a career spanning more than 40 years, Phill Niblock has not only proven himself as one of the most preeminent composers of the American musical avant-garde, but also an accomplished filmmaker and performer. He is also revered as an events producer through his Experimental Intermedia Foundation, providing a venue and a label that has been of great assistance to numerous other artists and musicians in helping to make their work known. This bilingual book (French/English) provides an in-depth look at all these activities, through various essays and interviews, either newly written, previously unpublished, or that have never been available in French before. These were written by very different people -- from musicians who have played Niblock's music, to fellow composers, from long-time friends to specialized musicologists and art historians. They discuss such various matters as musical and cinematographic aesthetics, psychoacoustic processes, historical background, philosophical insights and technical advice for playing the music, or just give their personal recollections of time spent together with Niblock. The book is accompanied by two double-sided DVDs of atypical videos: Remo Osaka, a continuation of The Movement of People Working series, with a quite peculiar soundtrack; two separate DVDs of the Anecdotes from Childhood, best viewed together as an installation; and Katherine Liberovskaya's 70 for 70 (+1), Seventy (one) Sides of Phill Niblock, realized in 2003/2004 on the occasion of his 70th birthday, which portrays the composer through memories recounted by friends and relatives. With writings by Phill Niblock, Rich Housh, Erika King, Guy de Bièvre, Volker Straebel, Richard Glover, Alan Licht, Seth Nehil, Rob Forman, Johannes Knesl, Arthur Stidfole, Juan Carlos Kase, Raphael Smarzoch, Jens Brand, Bob Gilmore, Ulrich Krieger, Richard Lainhart, Bernard Gendron, Susan Stenger, Mathieu Copeland, and liner notes from the first two LPs." 22.5 x 24.5 cm softcover; 520 pages (English/French dual language text) with illustrations; includes two PAL format, region free DVDs (each is double-sided, 8 hours of total video). Die Schachtel in collaboration with O' artspace proudly presents a deluxe DVD featuring six experimental films by New York-based composer, photographer and filmmaker Phill Niblock from the late-1960s. Anybody familiar with Niblock would probably characterize his work by the sound of his long, sonorous drones, producing rich overtones usually combined with a visual element -- since before moving into composition, Niblock was an active photographer and filmmaker. While he usually is known for his films from the Movement Of People Working series alongside performances of his music, Niblock's early works stand apart as unique objects. The integrity and consistency of his style is fully on display in these seldomly-seen or screened 16mm sound films wonders that include: Morning (1966-1969) from an idea by Phill Niblock and Jean Claude Van Itallie, filmed by PN, text by Lee Worley and Michael Corner, with members of the Open Theater group. Starring Lee Worley, James Barbosa, Cynthis Harris, Sharon Gans, Joseph Chaikin; text read by Lee Worley, James Barbosa, Barbara Porte, Dorothy Lyman, Michael Corner. Black & white 16mm film. The Magic Sun (1966-1968) with members of the Sun Ra Arkestra, music by Sun Ra and the Arkestra. Filmed on high-contrast black & white 16mm film. Dog Track (1969) -- a film by Phill Niblock, with a found text read by Barbara Porte. Color 16mm film. Annie (1968) -- a portrait of the dancer Ann Danoff, with a sound collage soundtrack. Color 16mm film. Max (1966-19) -- an image collage film/portrait of percussionist/sound-artist Max Neuhaus, with a collage soundtrack by Max Neuhaus. Black & white 16mm film. Raoul (1968-1969) -- a portrait of the painter Raoul Middleman, with extensive use of time-lapse film technique. The soundtrack is improvised by Raoul Middleman and Phill Niblock. Color 16mm film. Limited edition of 500 copies. NTSC, all-region DVD, stereo, 4:3 format. Run-time: 65 minutes. This is Phill Niblock's fourth release on the Touch label. Phill Niblock is a New York-based minimalist composer and multi-media musician and director of Experimental Intermedia, a foundation born in the flames of 1968's barricade-hopping. He has been a maverick presence on the fringes of the avant garde ever since. In the history books Niblock is the forgotten Minimalist. His influence has had more impact on younger composers such as Susan Stenger, Lois V Vierk, David First, and Glenn Branca, and he's also worked with Sonic Youth's Thurston Moore and Lee Ranaldo. Touch Strings features three new pieces completed between 2007 and 2008. "Stosspeng," a piece for guitars and bass guitars performed by Susan Stenger and Robert Poss, premiered at the Donau Festival in Krems, Austria in April of 2007 after recording sessions to obtain materials for the piece took place at Robert Poss's Trace Elements studio in New York. The material for "Poure" was recorded in Johan Vandermaelen's Amplus studio in Aaigem, Belgium, and premiered at Schuurlo, Sint-Maria-Aalter, Belgium on September 12, 2008. Performed by Arne Deforce on cello, "Poure" was commissioned by the Centre de Recherches et de Formation Musicales de Wallonie, CRFMW, Liege, Belgium. "One Large Rose," performed by The Nelly Boyd Ensemble (Robert Engelbrecht, cello; Jan Feddersen, piano strummed with nylon strings; Peter Imig, violin; Jens Roehm, acoustic bass guitar strummed with nylon strings or e-bow), was made with the musicians playing from a score, and recorded acoustically in real time, with four recordings of 46 minutes each superimposed, until a final mix was completed at Experimental Intermedia, New York in October of 2008. 2006 release, repressed. This is Phill Niblock's third release on the Touch label. Phill Niblock is a New York-based minimalist composer and multi-media musician and director of Experimental Intermedia, a foundation born in the flames of 1968's barricade hopping. He has been a maverick presence on the fringes of the avant garde ever since. In the history books Niblock is the forgotten Minimalist. His influence has had more impact on younger composers such as Susan Stenger, Lois V. Vierk, David First, and Glenn Branca. Touch Three is minimalism in the classic sense of the word, if that makes sense. Niblock constructs big 24-track digitally-processed monolithic microtonal drones, and the result is sound without melody or rhythm. Movement is slow, geologically slow. Changes are almost imperceptible, and his music has a tendency of creeping up on you. The vocal pieces are like some of Ligeti's choral works, but a little more phased. He says: "What I am doing with my music is to produce something without rhythm or melody, by using many microtones that cause movements very, very slowly." These nine pieces were made from March 2003 to January 2005. They were all made (except "Sax Mix") by recording a single instrument with a single microphone. The recordings were direct to the computer/hard disk, most of them using a Powerbook G4, Pro Tools, an M-box and an external firewire drive. The resulting mono sound files were edited to remove breathing spaces, leaving the natural decay of the tone, and the attack of the subsequent iteration of the same tone. Each note was represented by several repetitions, perhaps ten for each tone, of about 15 seconds duration each. Each piece uses a few tones. A simple chord, perhaps. Additional microtonal intervals were produced in Pro Tools using pitch shift. The pieces were assembled in multitracks, usually either 24 or 32 tracks. The recording environment varied from a simple apartment in Berlin (Ulrich Krieger's) to a very large hall used for symphony orchestra performances and recordings, with a sizable audience space. The recordings were generally done quite closely miked. One hears only the sound of the instrument. There is no electronic manipulation in the recording, the editing of the tones, or in the mix. The only changes to the recorded tones are the pitch shifts to create microtones...the microtones are doing the work.